Victor Rook has produced several award-winning films, as well as written and edited several books. His nature film Beyond the Garden Gate aired on PBS for four years and won two Telly awards. The DVD makes a great year-round gift. 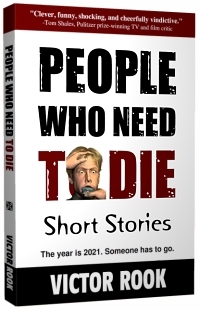 Recent books include People Who Need To Die, a collection of satirical horror stories; In Search of Good Times, a story about a man who believes that the TV sitcom families from "All in the Family" and "Good Times" are real; and Musings of a Dysfunctional Life, a humorous and poignant compilation of everyday mid-life musings. Services include web design, photography, book formatting and cover design, as well as ebook and paperback preparation. Contact to receive a quote for your specific project. Satire meets horror in 2021 when earth's inhabitants are allowed to do away with bad drivers, obnoxious cell phone users, litterbugs, horrible bosses, spammers, trolls, mean neighbors, Black Friday shoppers and more. Have your book professionally designed and published in both print and Kindle and made available for sale. Check out my discount packages and individual design services. I've helped many authors achieve their dreams of getting their books to the public.